Brawijaya Law Journal (BLJ) is an international journal established by Law Faculty of Brawijaya University. It has 1 volume with 2 issues per year. BLJ is an open access, double peer-reviewed e-journal which aims to offer an international scientific platform for national as well as cross-border legal research. The materials published include major academic papers dealing critically with various aspects and field of laws as well as shorter papers such as recently published book review and notes on topical issues of law. The goal of Brawijaya Law Journal is to bring the highest quality research to the widest possible audience. The journal is a law journal which addresses specificaly on legal issues covers both public and private law. It publishes articles on constitutional and administrative law, criminal law, civil law as well as international laws. The journal sets up specific topic to be covered in each issue which can be analyzed from many perspective of laws as mentioned. However, it does not limit itself on the discussions of Indonesian Law. BLJ accepted submission from all over the world. All submitted articles shall never been published elsewhere, original and not under consideration for other publication (For checking Plagiarism, BLJ Editorial Board will screen plagiarism with using Plagiarism Detector Program. If it is found plagiarism indication (above 15%), editorial board will automatically reject the manuscript immediately. Rapid development of technology has lead to a dynamic society. Such condition demands rapid adjusment of policy as well as legal framework both internationally and nationally. While borderless environment has been one of the sources of global changes, it is argued that the protection of public interests should be strongly maintained. At this point, the role of state in accomodating global changes while still preserving public interests is emergingly important. This is because the role of state in making a positive legislative environment would enable various arms of the state to explore and achive their potential while preserving high standard of operations to protect public interest. 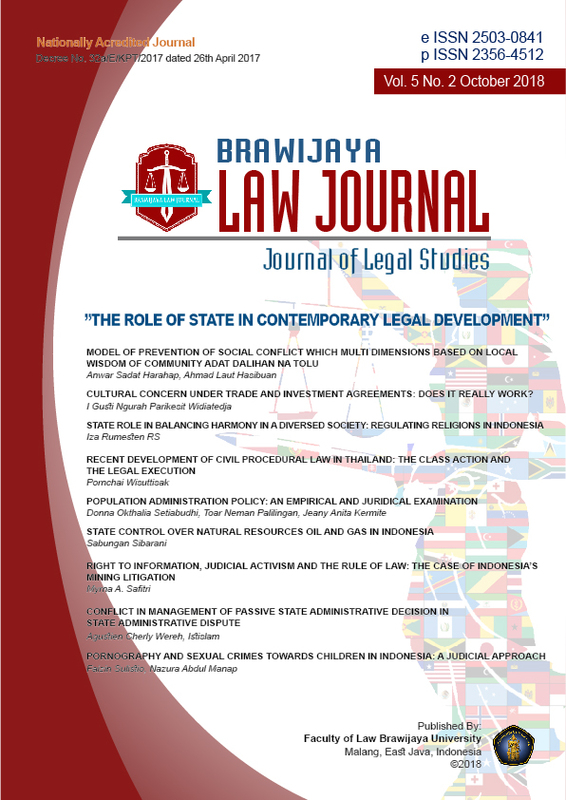 Having published last edition focusing on culture and technological influence in regulatuion, Brawijaya Law Journal is pleased to publish this current issue focusing on “The Role of State in Contemporary Legal Development” within Volume 5 Number 2 issue. The topic of the role of state can be discussed through variety of problems. This edition covers nine various papers related to the role of state ranging from the prevention of social conflict based on local wisdom to the state role in harmonizing regulation in diversed society. Other papers covers states’ role in areas of trade investment, state administrative disputes, natural resources management (especially in mining), class action and legal procedures, population administrative policy and judicial approach in child crimes. Cultural Concern under Trade and Investment Agreements: Does it Really Work?